1/29/2014 - This design needs some work, but I like the core idea that it's a self-contained dungeon dive. Who knows what treasures you'll find and what monsters you'll unleash? I'm not sure it should be black, and I have very little idea how much it should cost. Thoughts? I kind of want to give the opponent the choice to copy this spell as many times as he wants - more free creatures, more loot given away. Seems like that would rapidly approach auto-win for one of the two players. I think both in flavor (risk-taking for reward) and in function (chaos for everyone!) that this is red. This will win the game for you outright if you get lucky; e.g. you turn up a Karn Liberated and two noncreature cards. Since a catacomb is much like a graveyard, it's weird that "Search the Catacombs" cares about the library. This was also my first reaction. My second was to worry about running into a Catacomb Slug down there! Hmm. I suppose you could shuffle their graveyard and snag from that, but that reduces the unknown by about 800%. I'm totally fine with a player losing the game outright for playing cards like Karn Liberated if the other guy is willing to take the chance of giving them a free Emrakul. When CARDNAME enters the battlefield target player reveals cards from the top of their library until they reveal a creature card. That player puts the revealed card into play with a treasure counter on it and all other cards revealed this way on the bottom of their library in a random order. Whenever a creature with a treasure counter is put into a graveyard from play, you may search your library for a card and put it into your hand. 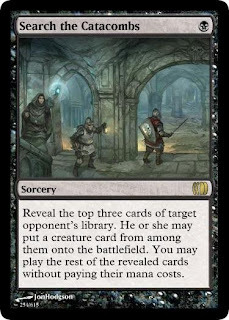 Its wordy, but I think it has a cool feel of "unknown monster in a dungeon that yields loot"
Maybe put the creature card OTB and exile the rest of the cards under it. When it dies, you get all of them, or just one of your choice, or some combination below CMC ~7? Oh, that's awesome. It'll be hard to balance, but I love the flavour of "do something dangerous, get treasure." 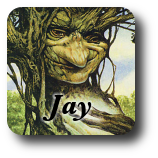 Target opponent exiles cards from the top of his or her library until he or she exiles a creature card. That player puts that card onto the battlefield with a treasure counter on it. When that creature dies, you may cast any number of the exiled cards without paying their mana costs. Target opponent exiles the top four cards of his or her library. That player puts a 5/5 red dragon creature token with flying onto the battlefield with a treasure counter on it. When that creature dies, you may cast any number of the exiled cards without paying their mana costs. Jules beat me to it. Ant's version is a lot safer, but I fear too safe: You lose a lot of the suspense when you know what the monster will be, and you can also just be prepared with a Plummet or Fireball. When CARDNAME enters the battlefield, target opponent exiles cards from the top of his or her library until he or she exiles a creature card. That player puts that card onto the battlefield with a treasure counter on it, and all other cards exiled this way beneath it. Whenever a creature with a treasure counter on it dies, you may cast any number of the exiled cards beneath that creature without paying their mana costs. also this card can be made less wordy without the treasure counter tech, but that allows for you to play another Dungeon Delver and be able to benefit from killing the creature. It helps preventing the feel bad moment where you play dungeon delver and the opponent turns up a shriekmaw..
"When Dungeon Delver enters the battlefield, target opponent exiles cards from the top of his or her library until he or she exiles a creature card. That player puts that card onto the battlefield and exiles all other cards revealed this way under it. When that creature dies, you may cast any number of the exiled cards under it without paying their mana costs." What do we get from putting this on a creature instead of a spell? The reason I wanted it on a permanent, is that I personally dislike spells that have a "lasting effect" that you have to track. you cast a spell, it goes to the yard, and then you have to remember that when the effected creature dies, something happens. If that spell is no longer in your graveyard (say shuffled back into your library) then its difficult to know what to do if you forget. Thats why I thought this would work better worded in a way that leaves the effect trigger on the battlefield attached to a permanent (A creature or enchantment). The downside to that, is that if you immediately respond to my permanent with removal, then I have a feel bad moment where I gave you a monster for free and you killed my means of getting treasure. The treasure counter created a way that you could summon another permanent to replace the one that was destroyed. I play dungeon delver, you put a shriekmaw into play as result. if there is no treasure counter, you just got a free creature. If there is one however, i can play a second dungeon delver, and then bolt your shriekmaw that is in play with a treasure counter on it to ensure i get something. All in all, I think this effect should be on a permanent so that it is easier to track. Also, don't make your land-drop first. It'd be worth testing some, but my hunch (for flavor, if nothing else) is that the split should be creature/noncreature. Reveal the top three cards of target opponent's library. He or she may put a creature card from among them onto the battlefield. You may play any noncreature cards revealed this way without paying their mana costs. Target player exiles cards from the top of their library until they exile a creature card. That player puts that card into play with all other cards exiled that way underneath it. When that creature dies this turn, you may play all cards underneath it without paying their mana costs. Until the end of turn, you may play cards in your hand without paying their mana costs as long as they target the creature brought into play by this spell. Which is again probably too wordy. This is a cool idea but getting it down to a small amount of text is challenging.